Post Mount Reflective Address Plaque - - reflective post sign sticks to the side of a mailbox post or support, or any relatively smooth surface or can be purchased with screw holes instead. Hard to find one piece house number sign with reflective background and easy to read 2.25" numbers. Vertical mount. Made in USA. In the event of an emergency when seconds count, this sign can help first responders find your house quickly. To maximize visibility from both directions, we suggest purchasing two reflective signs. Custom made to fit vertically on a typical 4x4 sign post, house pillar, or mailbox support. Personalized with the address numbers and/or letters you specify. Made from sturdy and UV-stabilized laminated, non-rusting acrylic. Raised characters are part of the sign itself, not printed or painted on. Holds up to three (3) 2" numbers or letters. Characters and border are black on a reflective background..
Comes with exterior quality adhesive back for simple installation on any relatively smooth, clean surface. Or you can purchase with two 3/16" diameter fastener holes instead and in this instance stainless steel mounting screws will be supplied. You may also purchase with both adhesive back and holes. No holes to drill or hardware required. Dimensions: 3.5"W x 7.5"H x 1/8". One piece reflective address sign to install on a mailbox post or support. Holds one, two, or three numbers. Affix to any narrow wooden, plastic, or metal sign post. Made in USA. 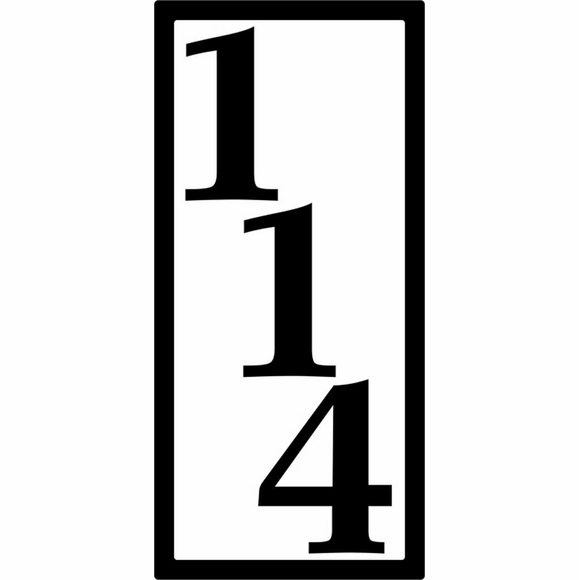 Reflective address signs are also known as 911 address signs, 911 address markers, or first responder signs.